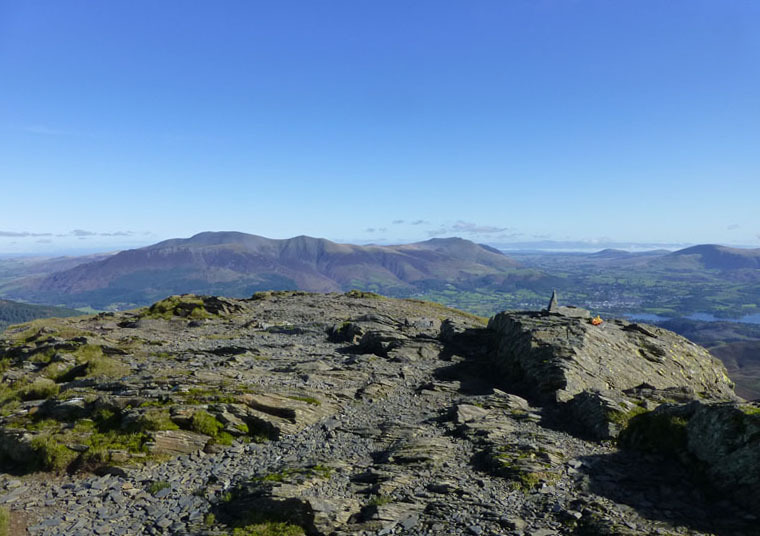 There's something about the corner of Lakeland that is the high ground of the North Western Fells (as defined by Wainwright), the fells are big, the views are fantastic, the edges are well defined and the walk opportunities are abundant. Little wonder then, that I chose this territory for my second walk of the weekend. I camped at Scotgate, Braithwaite. 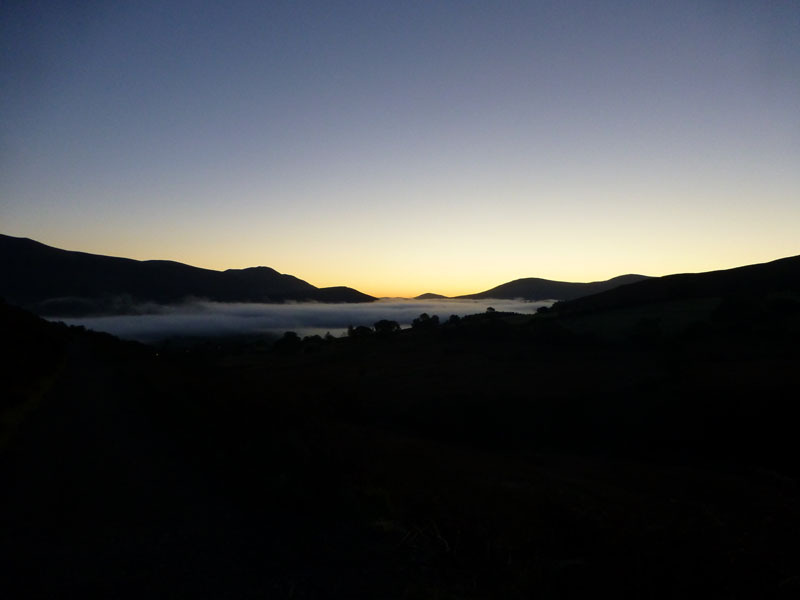 There was a little frost on the tent and car and when I unzipped the door of the tent and peeped out, the stars were out and Autumnal mist was just discernable over the flat lands between Braithwaite and Keswick. After a brew and Weetabix, I started the walk at 06:35hrs. 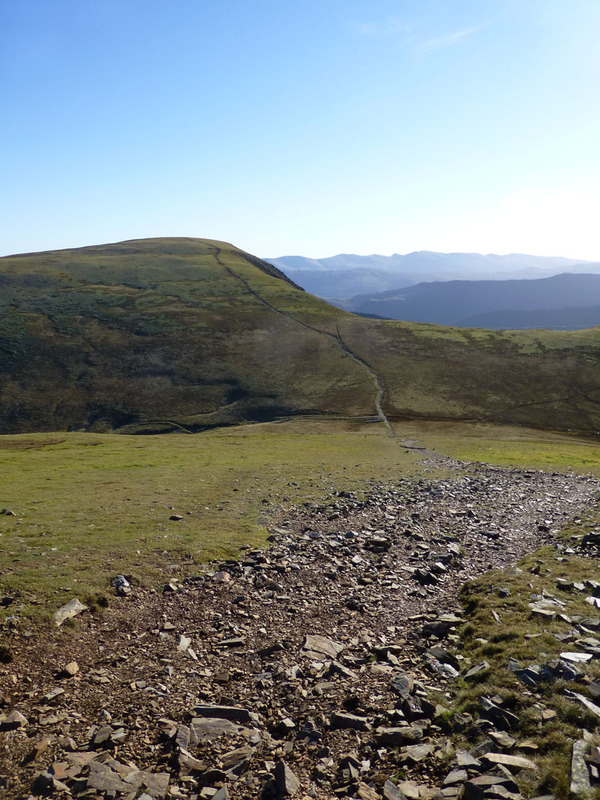 Fifty minutes later and the shadow of Barrow is cast on to the lower slopes of Grisedale Pike. 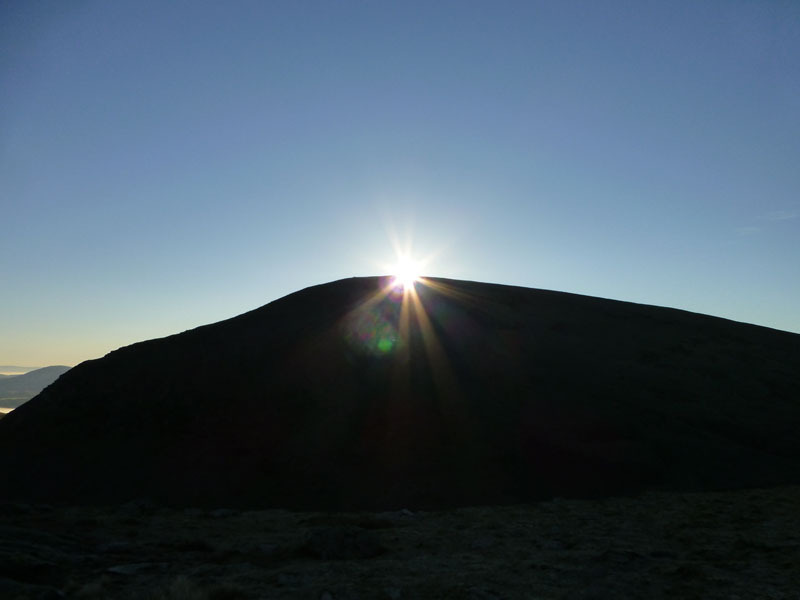 By taking the valley route, I sacrificed the opportunity to see the sun rise over the horizon. 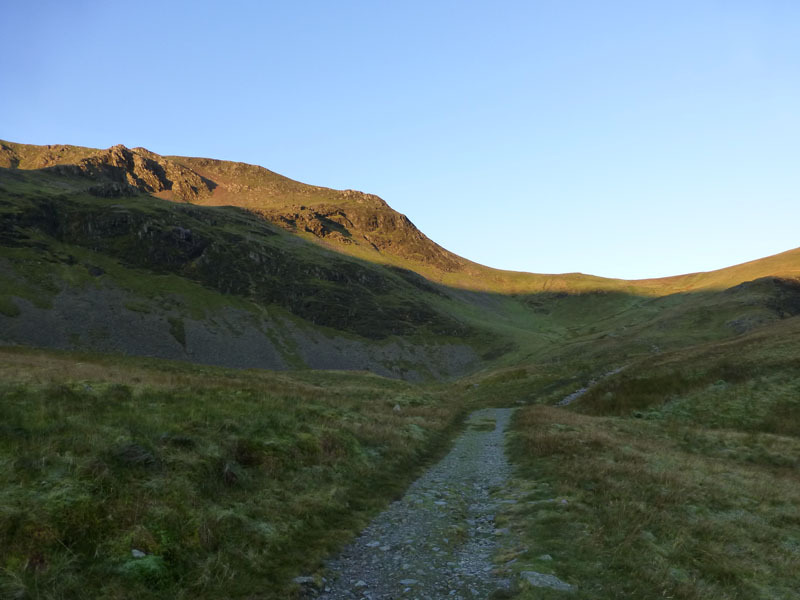 The northern edge of Eel Crag is illuminated as I head to Coledale Hause. 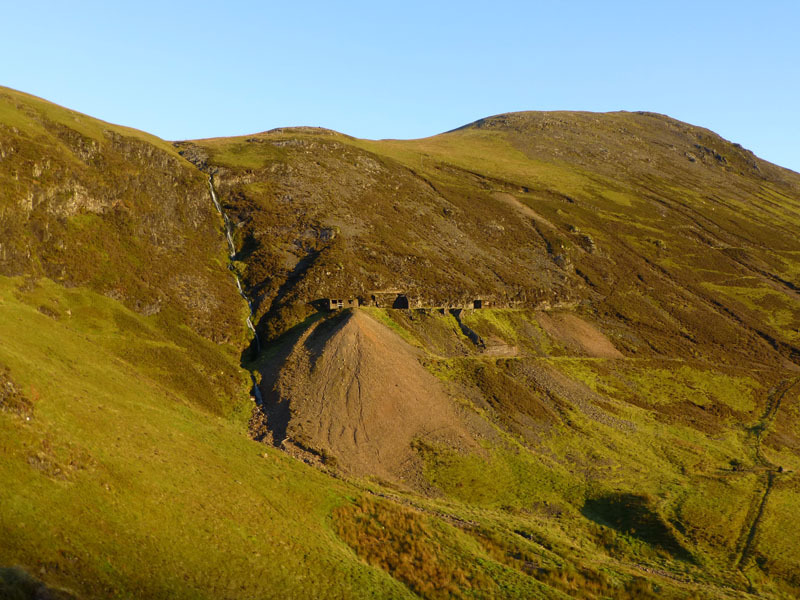 Abandoned mineworkings at High Force on the eastern slopes of Sand Hill, the opposite side of the ridge to Hobcarton Crag. This changing light opens up all manner of photo opportunities. 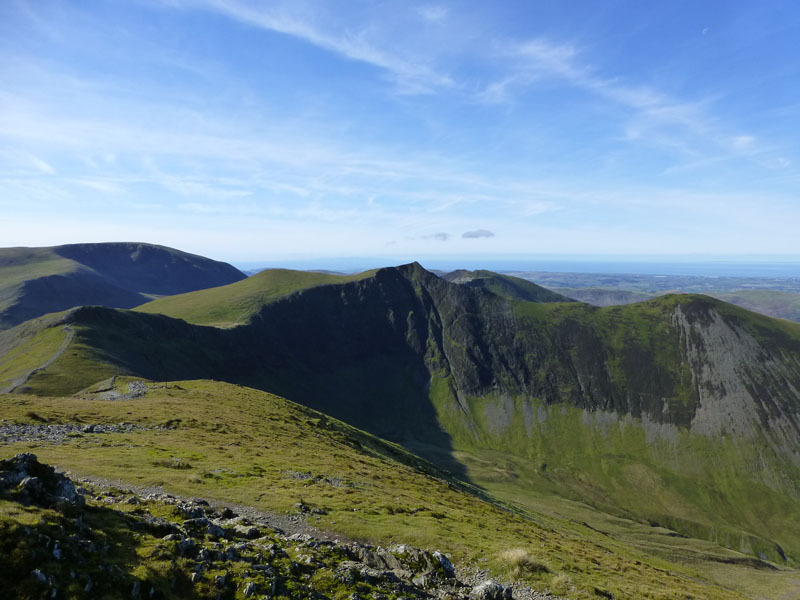 My target fell is Grasmoor. 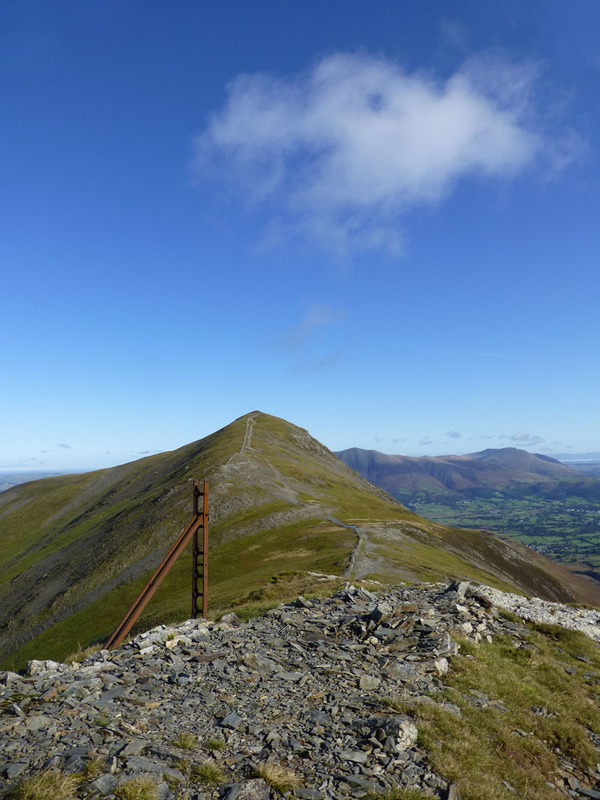 I don't suppose too many walkers leave Braithwaite for Grasmoor (direct), but I've made most of the other fells my "first fell of the day" on other walks, so here was the chance for something different. At 08:25hrs, many B&B'ers will be unfolding their napkins and settling down for the usual fare in such establishments. I'll meet some of them later on, they should consider the merits of an earlier start! 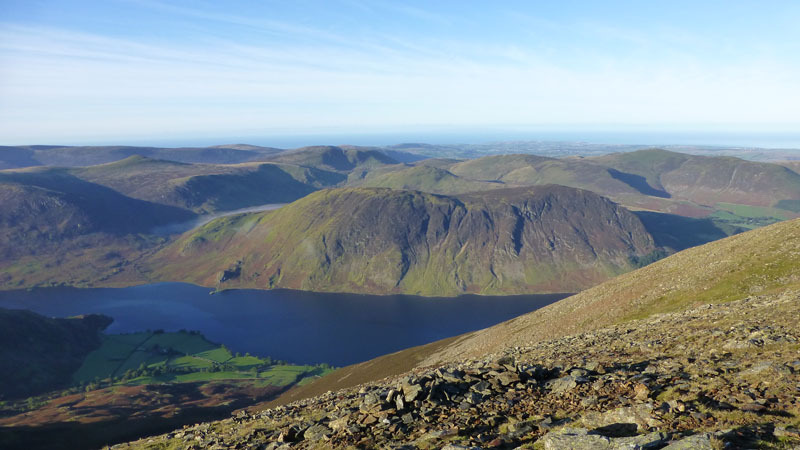 "...a remarkable repeated pattern of aretes and scree-runs." (Wainwright). 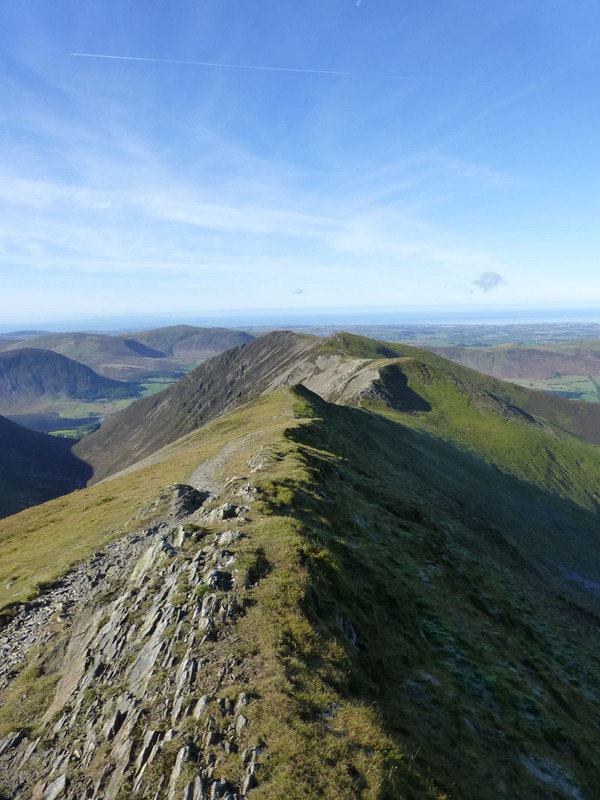 Visit Grasmoor for the best view of this fine display of rock-cut gullies. 09:05hrs and the pleasure is all mine! Peace and serenity, not a hint of a breeze; no clatter of boots and poles; no seats bagged in the shelter; not a cloud in the sky. "Morning!" 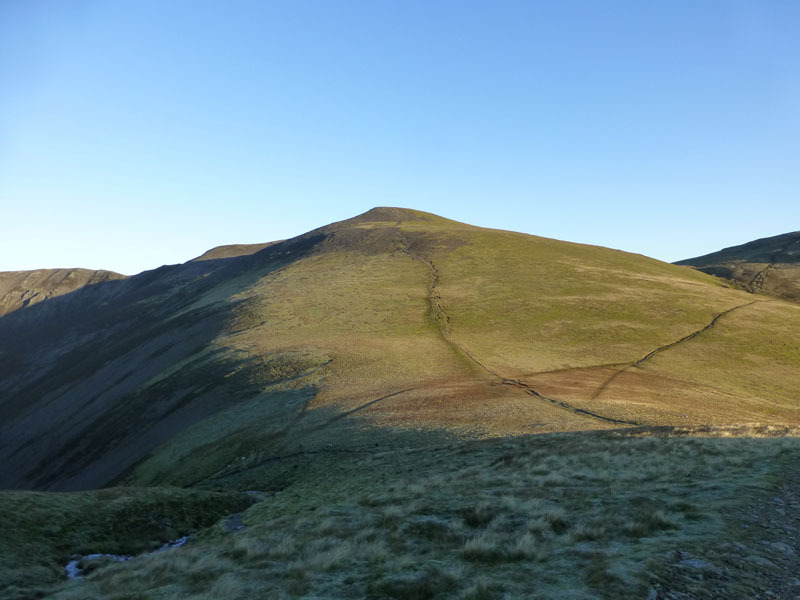 boomed the runner on his round of the NW fells! Ah well, he was a pleasant enough chap and we had a chat and remarked how fantastic it was up here on this fine morning. 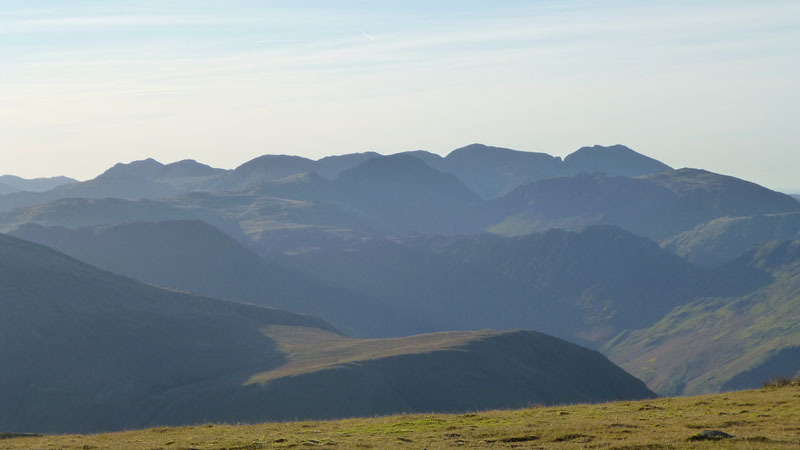 The westest, Western fells, a scene dominated by Mellbreak. A little mist is lurking behind the fell and over Floutern Tarn. 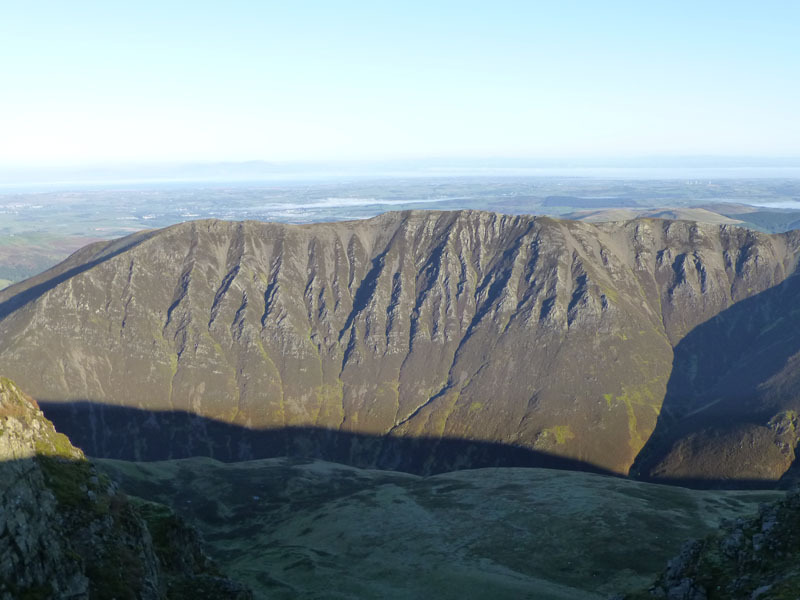 Next stop will be the summit known to Wainwright devotees as Eel Crag. 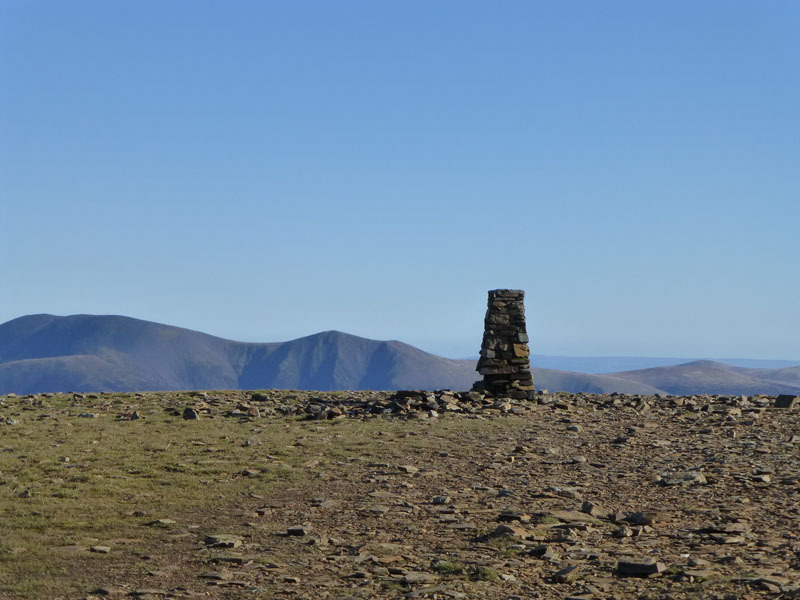 Ordnance Survey maps refer to Crag Hill. 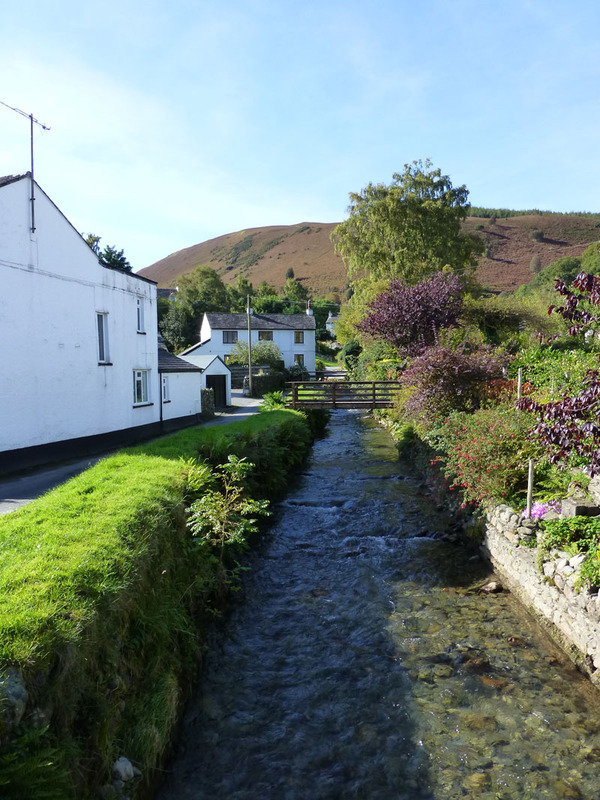 It looks like Crag Hill from here and Eel Crag from the other side, take your pick. The raised ground is Wandope Summit, not on the agenda today. Right up there as a favourite fell top for me. Fantastic view to the north and wide open spaces. It's 10:15hrs and the last remains of the valley mist are dispersing. 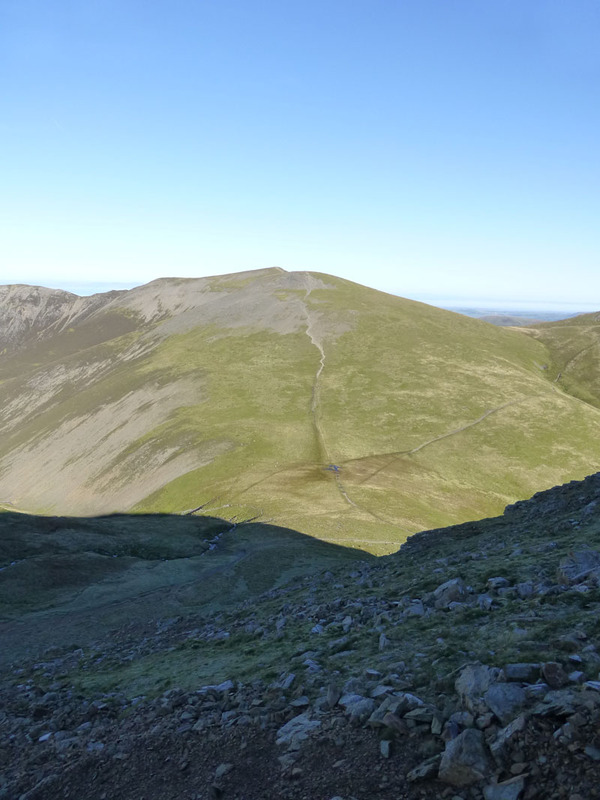 Outerside (right, in clear view) casts a long shadow across Coledale. 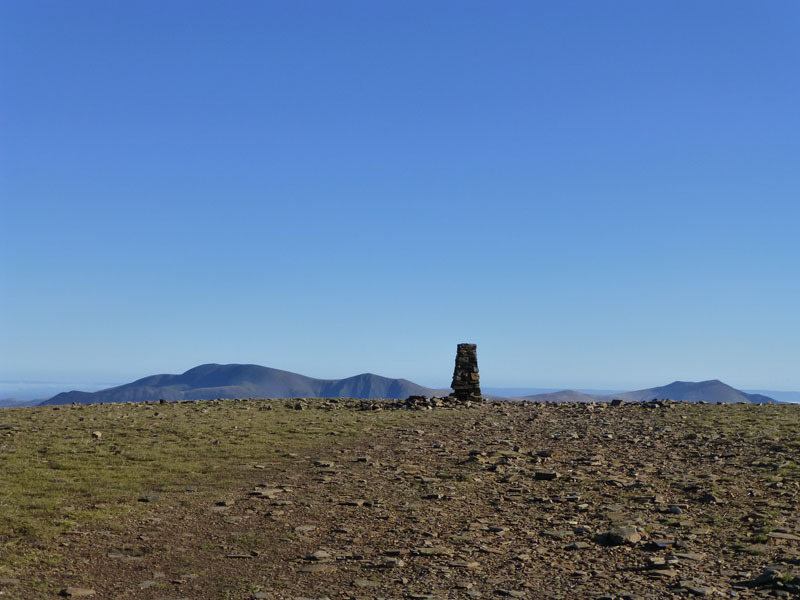 Skiddaw commands the attention, seven miles away; Longlands Fell peeps around the "massif" on the left-hand side. 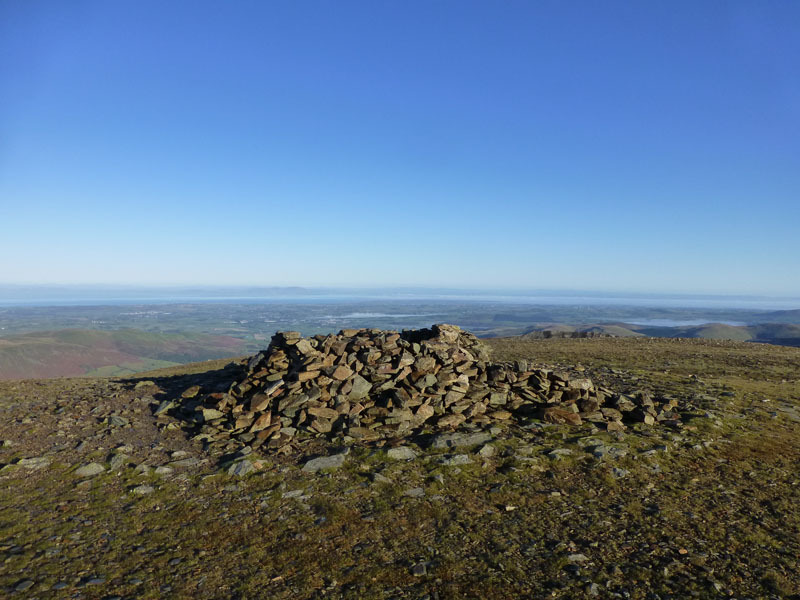 Note added 9th Oct: reaching Eel Crag Summit brought my aggregate total of "Wainwright's" Lakeland Summits reached and recorded to 600. It'll be a few more than that, but the early stuff wasn't accurately documented. 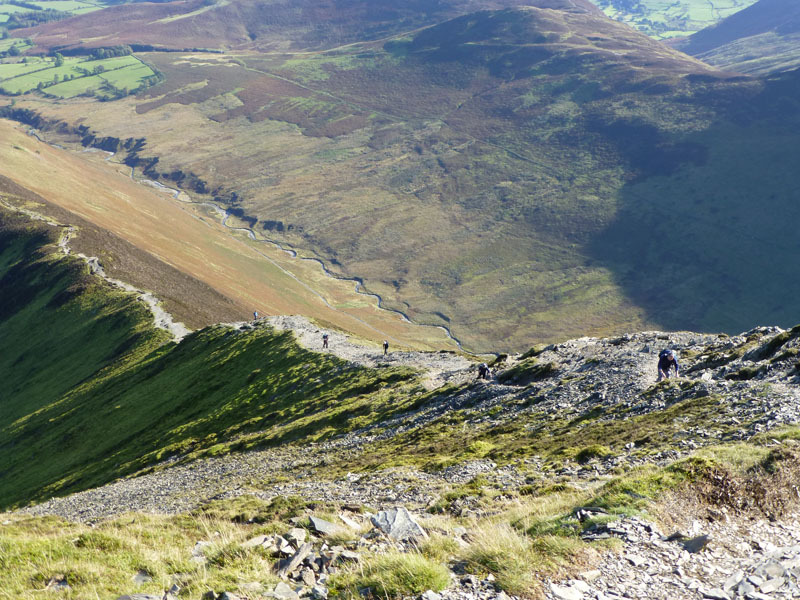 The steep descent off Eel Crag is not much fun, indeed it was the only part of today's walk that posed any degree of difficulty, loose scree in abundance. 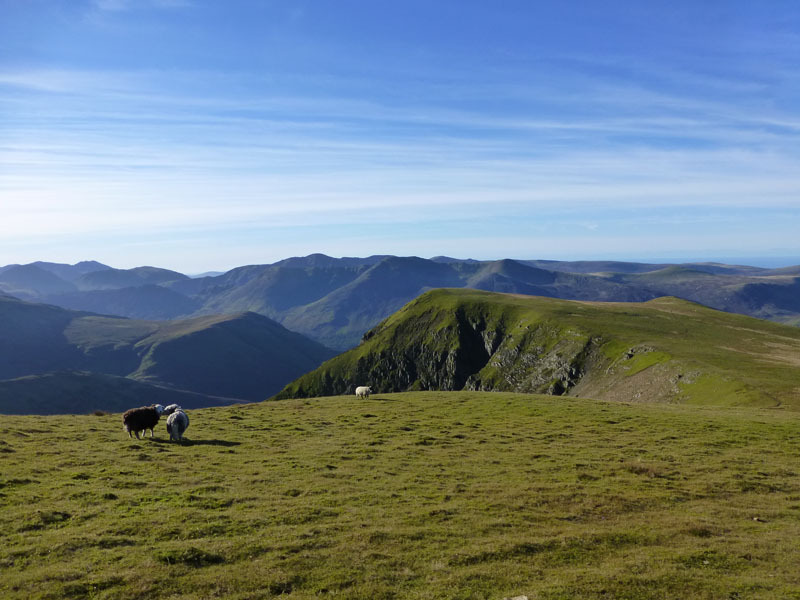 Sand Hill sits on the shoulder of Hopegill Head and I will cross Coledale Hause for the second time. 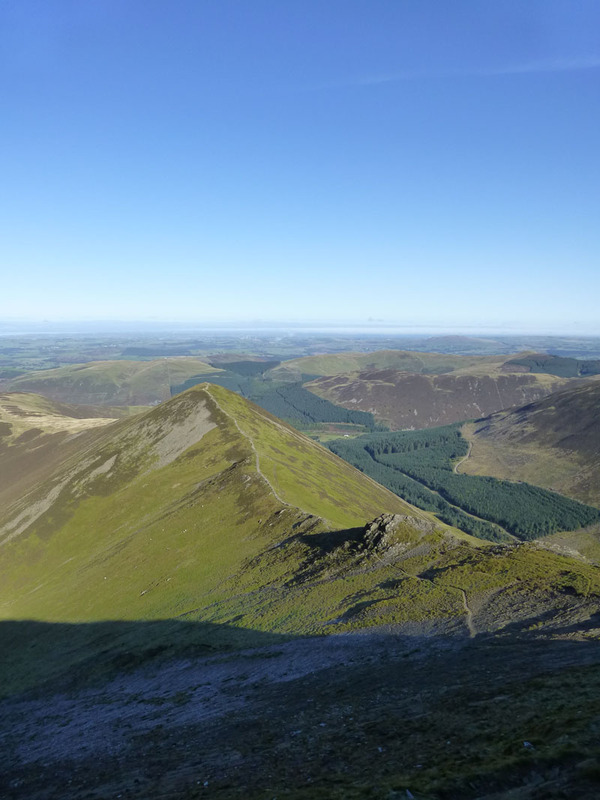 The walk from Hopegill Head to Grisedale Pike is a quick-step with optimistic strides taking the walker to another great viewpoint. Now the bit that I'm really looking forward to! The steep descent is a steep ascent for the late starters, the cosy B&B'ers perspiring and cursing their avarice at the breakfast table. 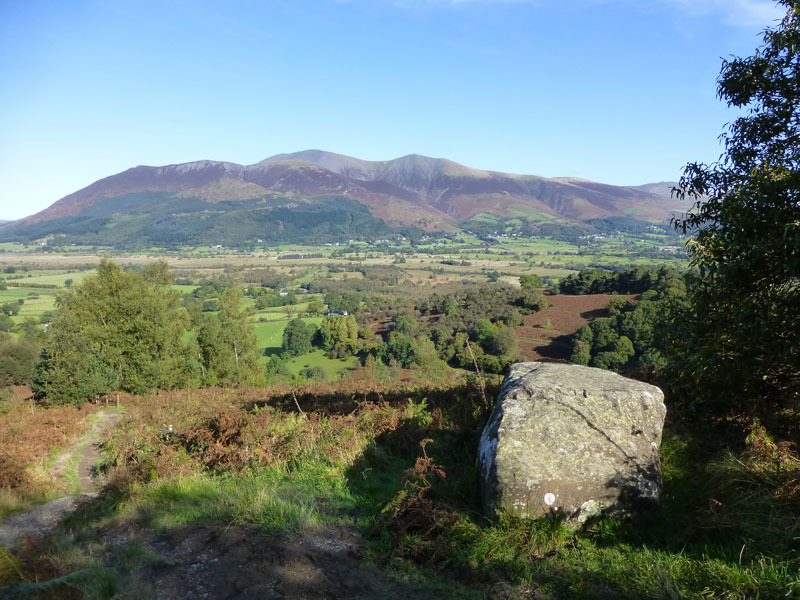 The mini-mountain, Kinn, sits neatly at the foot of Grisedale Pike's eastern flank. Several rounded boulders can be found around the 600ft contour, I'm wondering if these are "erratics". All the fells visited today are devoid of boulders and these look out of place. There was no way I was going to pack the tent at 6:30 this morning, I'd already asked the boss for a "late pass", so that I could keep car and tent on the site beyond the noon deadline. I don't think I was overstaying my welcome and preventing someone else from pitching their tent. Walk completion at 13:30hrs. Time taken: 6hrs 55mins over a distance of about 12 miles. 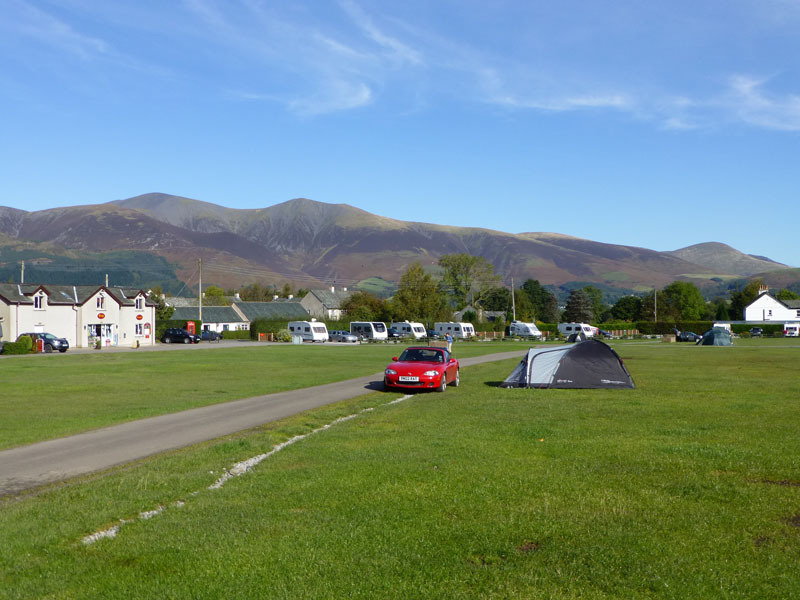 Route: Scotgate Campsite, Coledale, Coledale Hause, Dove Crags, Grasmoor, Eel Crag, Coledale Hause, Hopegill Head, Grisedale Pike, Kinn, Braithwaite and back to the campsite. Weather and Conditions: Sunny, calm, Fab! 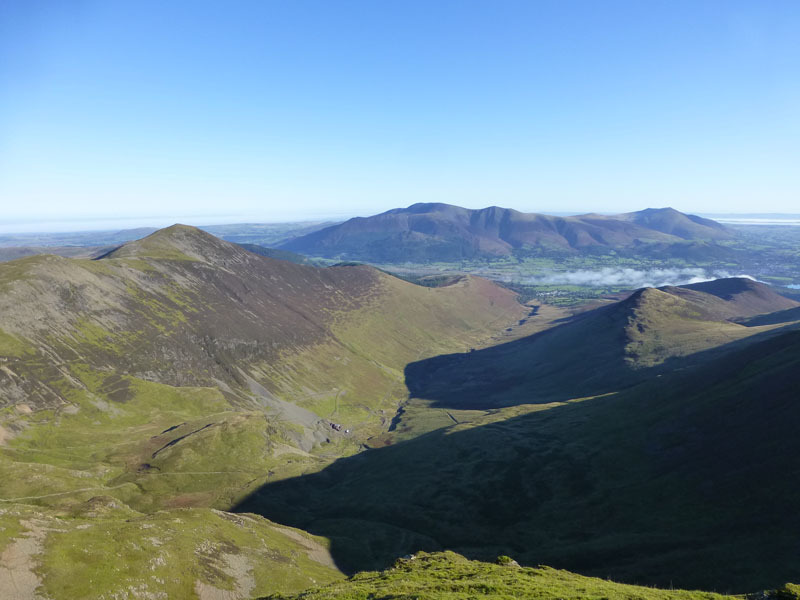 Greetings Count: The runner on Grasmoor then a nod at Coledale Hause (2nd time) and the late starters began to appear on Hopegill Head. Richard's Refreshment Review: I got a bacon butty at the cafe on the campsite after the walk. They run a neat little cafe, worth a look if you're hungry and in the area. Restricted hours out of the main season. What a great 2 days you've had. Fantastic pic looking towards Ill Bell. 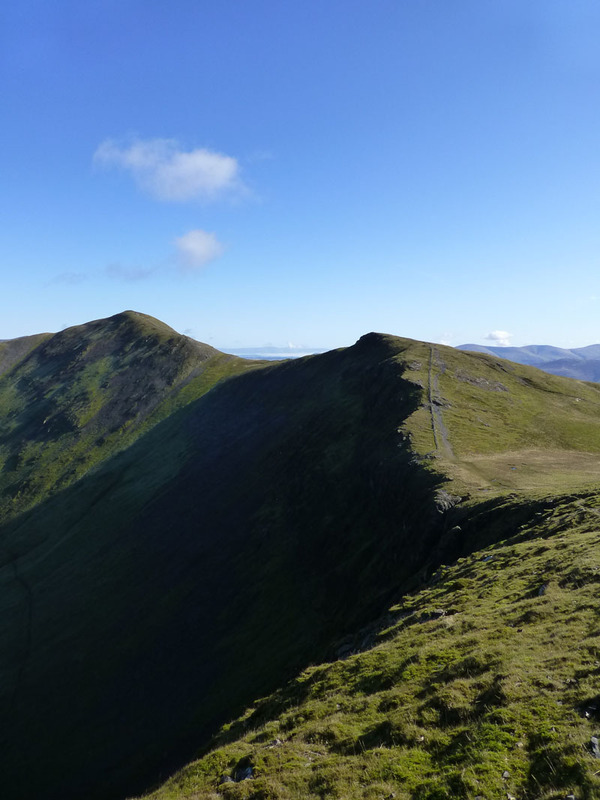 Both of those walks were on my list for this year as I've only climbed Grasmoor once and have never ascended High Street via Rough Crag. We are now entering into my favourite time of year. What can I say, other than it was worth waiting for Smile Absolutely fantastic, far too many fab ones to choose a favourite. You couldn't have picked a better weekend. Two cracking walks there. 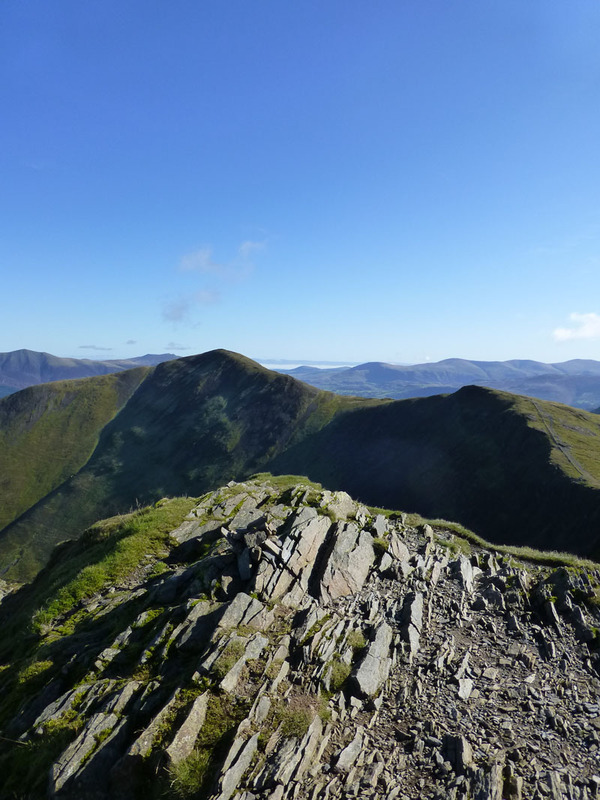 I love the Rough Crag/Long Stile ascent to High Street, grand walking and superb views all around. Those shelters as Small Water are fascinating – I passed them on a walk earlier this year and were it not for teh fact that this was at the start of quite a long walk I would have lingered longer and investigated them more thoroughly. 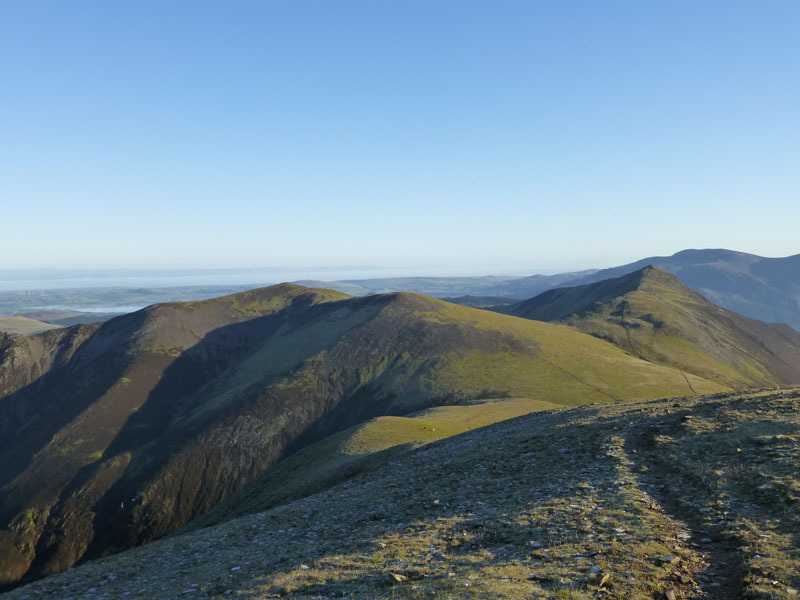 An interesting way of ascending Grasmoor, I think you might have blazed a trail there as I can’t imagine many others will have taken that route. Re Crag Hill/Ell Crag – I’m a Crag Hill man myself and I think Wainwright was wrong here and the Ordnance Survey correct as Crag Hill properly refers to the fell whilst Eel Crag is the crag overlooking Coledale at the north eastern end of the fell (Bill Birkett gives the Eel Crag name to the lesser top at this end of the fell but acknowledges that the crag is really the crag face further to the east). BTW camping at this time of year and at your age? (!!) Are you mad? No wonder you were up and about so early, you needed to get active to warm up. I bet the cold woke you up. It must have been nithering overnight. 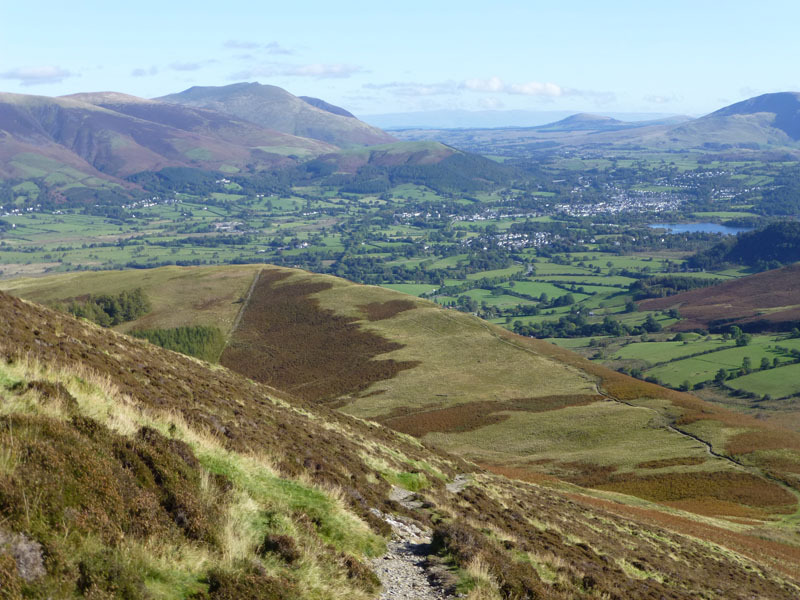 Glad to see you were back walking the Lakeland Fells. Grand use of the weekend, a shame the weather disappointed on Saturday but I have a feeling that Sunday more than made up for that! 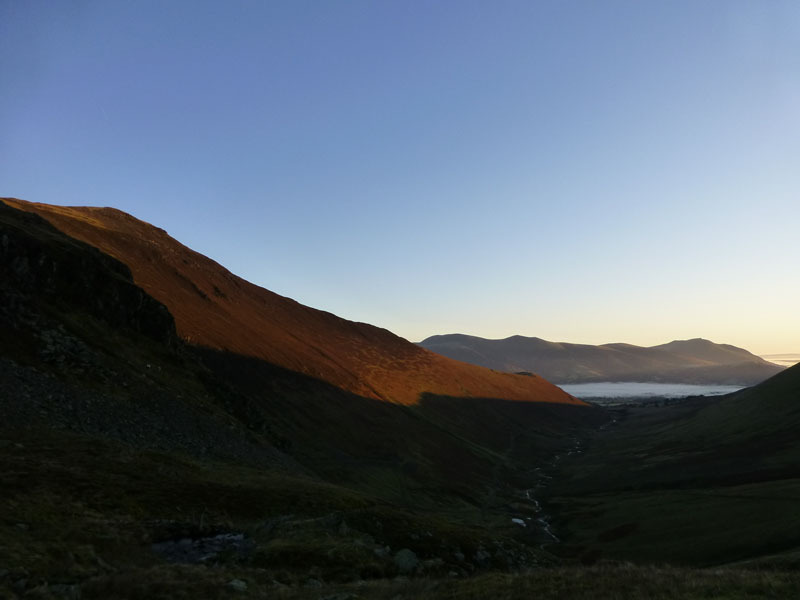 Brilliant photographs of the various fells you could see, the slightly colder air gives a much welcomed clarity to the views. 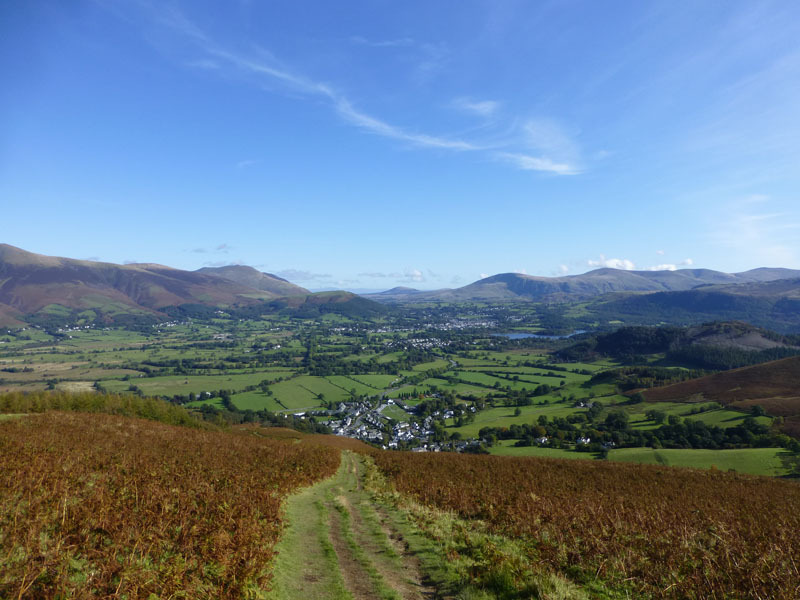 I enjoyed the photos and accounts of your weekend in the Lakes. I too did High Street via Long Stile for the first time this year. A great way up but not very accessible if you don't have a car. Sunday was a great day to be out and when I saw your first picture I said to myself 'that's an early start'. 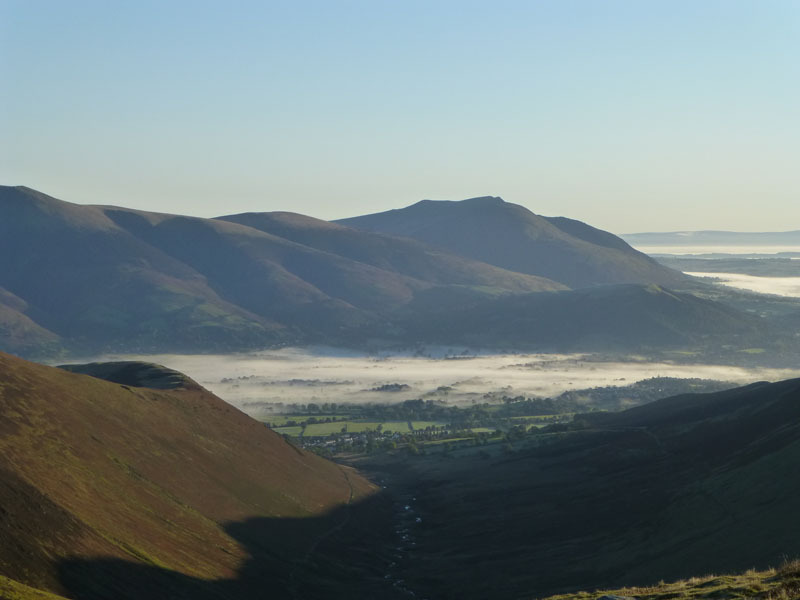 I was still having breakfast in Preston at 6.35am but managed a 9am start for my walk up Skiddaw Little Man etc.. I think you got the best of the sun for pictures. 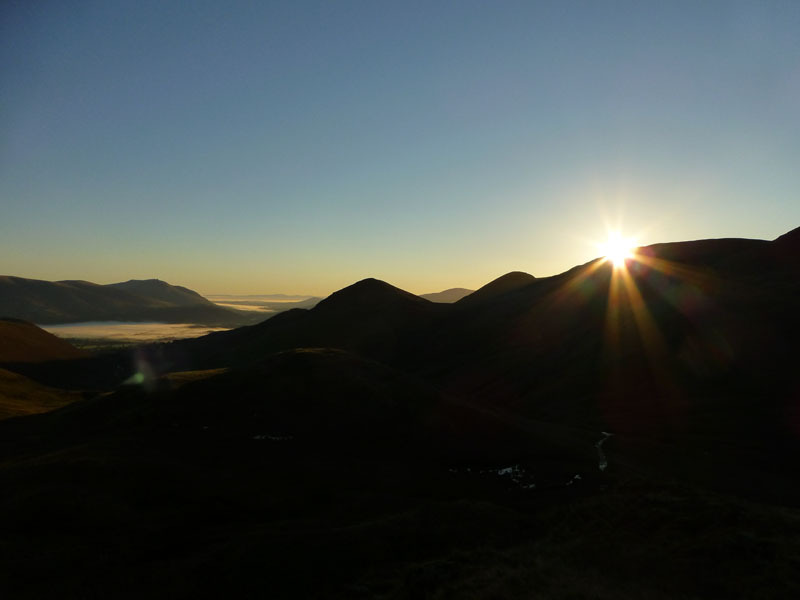 The one problem with Skiddaw at this time of year is that you are looking back into the Sun for most pictures or those that include Fells. 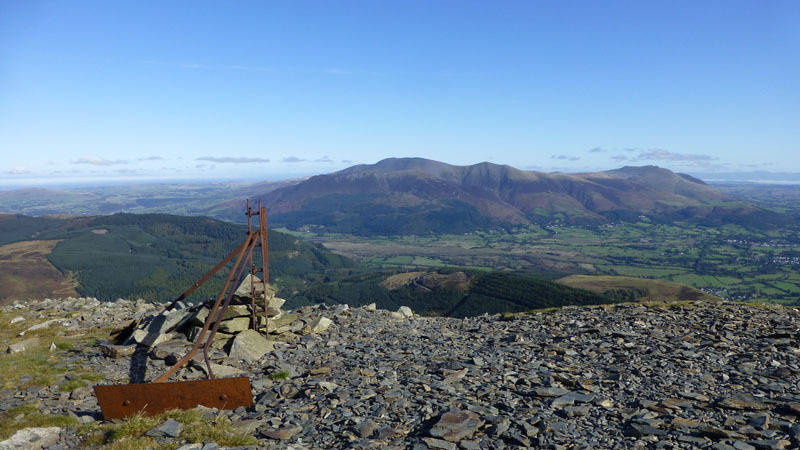 If you are contemplating an 'ascent' of Skiddaw Little Man I am not sure I would recommend the route I took. (SW Arete) It was a bit of a slog and the absence of any path made the trudge through the heather a bit more difficult. Good to see you back in the Lakes. I have enjoyed your Railway walks and Welsh adventures. 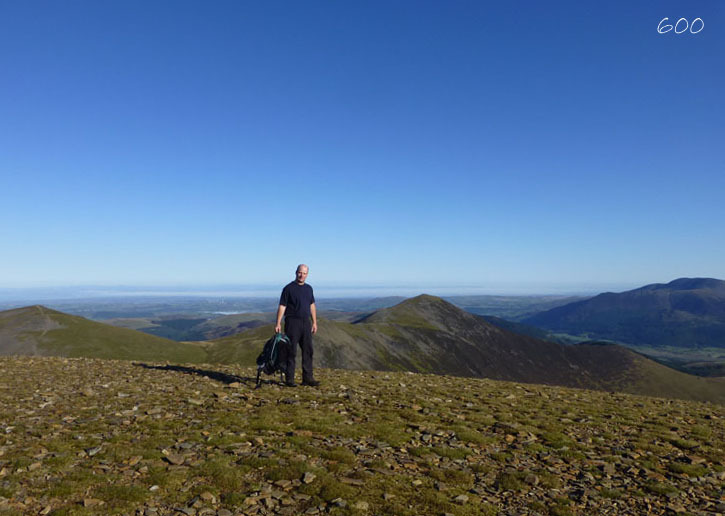 Ed's photos of Skiddaw on the same day as my Grasmoor ascent (Ed) That's Editor, not Edmund. frosty tent. Great pictures from a great place!